Hilaire Fernandes is the vice-president of the OFSET, an organization to promote the development of free (as in freedom) education software for the Gnome desktop. He has also written Dr.Geo an award winning interactive geometry software and he is currently busy with Dr.Genius another mathematic education software for the Gnome desktop. This series of articles is especially written for beginner in Gnome programming and GNU/Linux. The chosen development language, Python, avoids the common overload with compiled languages as C. Prior to the reading of this article some knowledge about Python programming is necessary. [ http://www.python.org/emacs/python-mode/ ] for emacs. At this location there is also explanation how to install it. Also you may need the original .glade [ color.glade ] file and the Python source code. [ couleur.py ]. Don't forget, you may have to start your Python code from a terminal to get this variable set. Glade is an interface builder developed by Damon Chaplin. It allows graphical and interactive construction of Gnome/Gtk graphical user interfaces. From Glade, the generated interface can be saved in a xml file or directly exported to C code to be included in a C source tree. Glade also allows to define the name of the handlers - functions - to be attached to the various event of the interface. For example the function (name) to be called when a specific menu item is pressed. LibGlade is a library written by James Henstridge to generate on the fly an interface represented by a Glade xml file. The application just needs to be aware of the xml file - generally ending by the .glade extension - and then LibGlade can generate the interface from it. 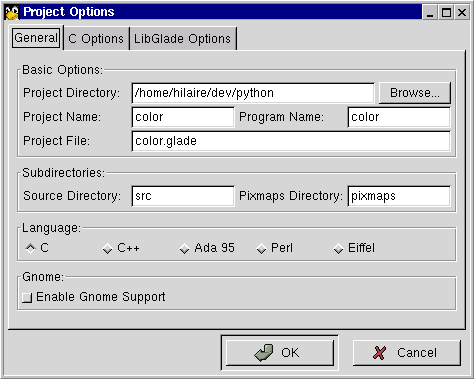 James Henstridge has also written the LibGlade Pyhton binding - among others - found in the Gnome-Python package. 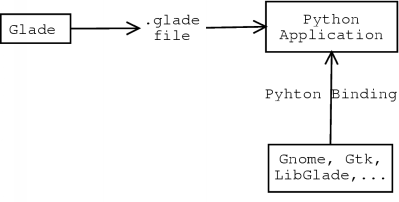 LibGlade also allows to auto-connect - almost in Python - the handlers defined in the .glade file to functions defined in the Python code. The following graph shows this general mechanism. To understand how the Pyhton binding is implemented, it's sometimes necessary to look at the Gtk, Gnome, LibGlade Python modules located in PYTHONPATH in order to compare them to the C Gtk/Gnome developer documentation. As a first approach to Gnome-Python programming, I propose a simple color game where kids have to recognize shapes of the same color. This example is very graphic oriented and presents nice features of Gnome such as the Gnome Canvas and the Gnome Application Window. 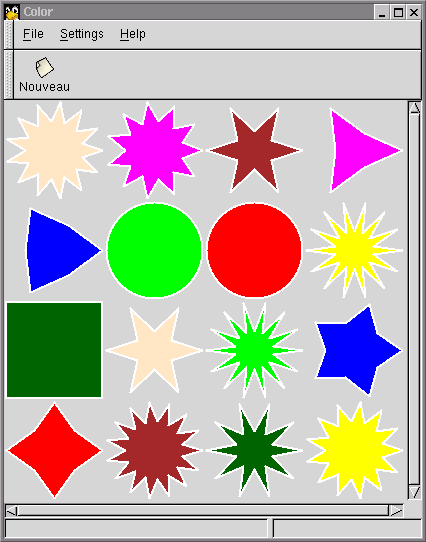 The rules of this game are quite simple: the game board is filled with 16 shapes - circles, stars and squares - of different colors. All this 16 shapes are divided in 8 pairs of identical color. To finish the game, just select successively these 8 pairs. You might want to look first at the code at the end of this document to get an overall idea and then resume from here. After starting Glade, you will get two windows. One is a widget tool box, called Palette. Form this one you can select the categories of widget among GTK+ Basic, GTK+ Additional and Gnome. If you don't have the Gnome widget, Glade may have been compiled without Gnome support. Check the configure of the source Glade package, configure --help explains the configuration options. 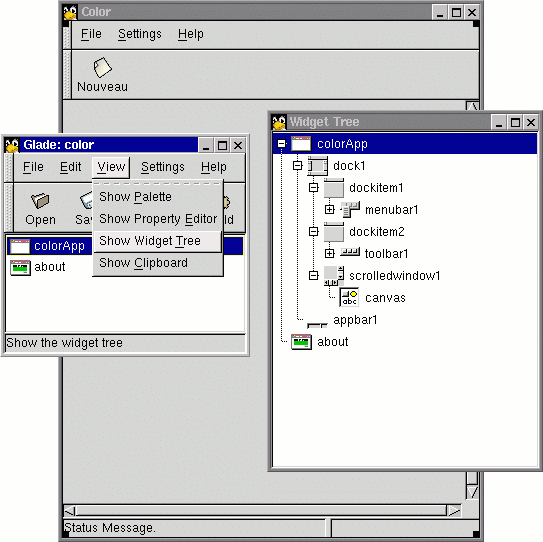 The other window lists in its main area the created widgets. With Glade, we first create a Gnome Application Window. This widget is a window with menu bar & tool bar. Both are packed on the handled dock. On the bottom of the Gnome Application Window there is also already packed a status bar. After creating a Gnome Application Window, open the Widget Tree dialog (you will find it in the view menu in Glade). Now you can explore what is exactly packed in this widget. Next add a canvas in the main area of the Gnome application widget. 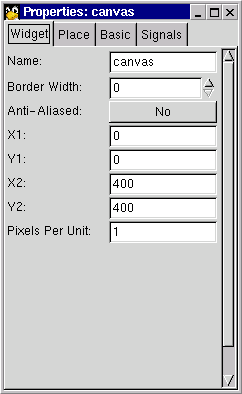 From the properties dialog, set its maximal coordinates to 400 and its maximal height and width to 400. And now create a Gnome About Dialog. You can adjust its content from the properties dialog in the Widget sheet. All these widgets are in the Gnome category of the Palette. Now remove the unused icon buttons and menu items. In the tool bar remove the Open and Save icon buttons. Next edit the menu bar (right click over it and choose edit menu) and remove all menus and menu items except for File->New, File->Exit, Setting->Preferences and Help->About. The handler names are function names to be called when an event occurs on a particular widget. This means, we will define functions in Python using these names - almost as you will see later. For example when the user clicks on the new icon button we want to call a function to reset the game. To set this up from Glade, you first need to select the widget, then adjust from the Signals sheet in the properties dialog. 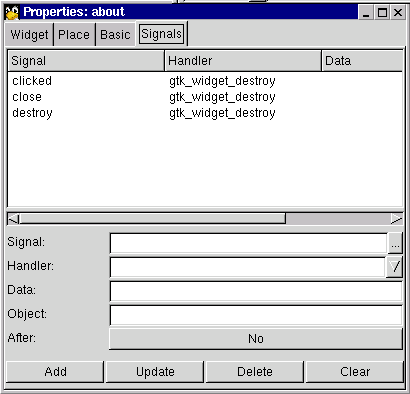 The gtk_widget_destroy handler is predefined in GTK. It just destroys the widget. The file representing the widgets is color.glade. Adjust the path to your own home directory. Now save the file from the File menu. Do not build source code, we don't use that feature. We have now finish with Glade and we can now start with Python. The complete code is at the end of this document. It must be saved in the same location of the color.glade file. The above assumes that the Gnome binding was installed in /usr/local/lib/python1.5/site-packages. In this Python example, we use the Gnome Canvas to manipulate shapes - actually stars, circles and squares. A canvas is a placeholder for graphic items (ellipse, point, line, rectangle), text items and even widgets. In fact, a canvas can contain several canvas groups. Finally, in a canvas group one can place canvas items - our shapes. By default a canvas contains one default canvas group, called root canvas group, we will use this one to place our shapes. selectedItem: to hold reference of a selected shape (star, circle or square). These shapes are in fact GnomeCanvasItem objects. Building the widget is done with the GladeXML function. Of course you need to adjust the path to the color.glade file. This function builds up and shows up the colorApp Gnome Application Window we defined with Glade. It returns an object - really a class - with useful methods. Next we connect the handlers we have defined in Python - more on that latter - to the widgets defined in the color.glade file. For that, we need to build a dictionary which holds keys for the handler names defined in the color.glade file: on_about_activate, on_exit1_activate and on_new_activate. The associated values to this keys are the function names defined in Python. Finally, the signal_autoconnect method does the rest of the job for us. Last we fetch the reference of the canvas constructed during the GladeXML call - a GnomeCanvas object in Python - and the root canvas group - a GnomeCanvasGroup object. GladeXML is in fact an object, so we were just calling the __init__ constructor. Its first argument is filename as expected - the self is an automatic argument representing a reference to the current object. The second argument root is the top level widget name from where we want to build the GUI. This method then calls a C function glade_xml_new_with_domain. You can now look at the C documentation of LibGlade to get more information about the glade_xml_new_with_domain function. In the GladeXML object, there is a get_widget method. This method just call the glade_xml_get_widget C function. So when Python runs canvas = wTree.get_widget ("canvas"), it calls the glade_xml_get_widget C function. The GnomeCanvas object, this class has the root method we use in our Python code. It is connected to the gnome_canvas_root C function. For each Gnome use in Python we can do the same to get the related documentation. I let you read the related Gnome documentation to learn more about these functions. There are three handlers to auto-connect to the GUI. There are on_about_activate, on_new_activate and mainquit. The last one is in fact a Python function to stop and exit from Python. This handler opens the about dialog. We first fetch a reference of the about dialog - in fact LibGlade build it through the GladeXML object. Remember GladeXML is a Python object with a method - among other - called get_widget. This method returns a GtkWidget object which contains the show method. Look for the GtkWidget object in the gtk.py binding. You can see that this object has a show method. The previous handler body can be written as: GladeXML("color.glade","about").get_widget("about").show(). This handler rebuilds a new game area. The existing shapes are first destroyed. The shapes are GnomeCanvasItem objects derived from GtkObject objects. The destroy method is located in GtkObject object. Next a new game area is built. The buildGameArea function coordinates the creation of the game area in the GnomeCanvasGroup group. The shapes - GnomeCanvasItem - are built from calls to the buildShape function. The shapes can be circle, square or star. The variable group holds a reference to a GnomeCanvasGroup object. If we look in the ui.py binding, the GnomeCanvasGroup has an add method. Its first argument, tp expects a string containing the item type to add. Its next arguments are pairs of keyword arguments and values, they are matched against a dictionary. To get the full list of available keywords, look in the GnomeCanvasRect, GnomeCanvasEllipse and GnomeCanvasPolygon objects in ui.py. The ellipse and rectangle are quite similar, the two abscissa and ordinate coordinates define two opposite top points of their bounding box, respectively top-left and bottom-right. The origin of the canvas is by default located at the top-left of the canvas. The polygon expects as value of the points keyword, a list of pair coordinates defining the points of the polygon. The other arguments are quite evident to understand. We just use the connect method of the GtkObject which is an ancestor object of GnomeCanvasItem. Its first argument is the signal. As GnomeCanvasItem has a single signal event to cover all types of event, we just set it to event. The second argument is the handler name we wrote, here shapeEvent. Eventually we can pass data in a third argument, but we don't need. That's all! BUTTON_PRESS: when the user presses one of the mouse buttons over a shape we alternatively select it, remove it or do nothing. If there is already a selected item we check if their colors match. 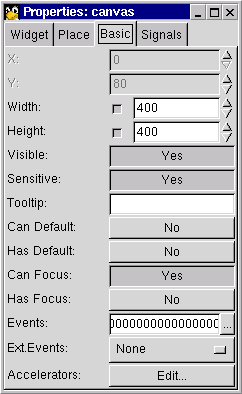 To do this we can get their attributes using the overload operator  over item and selectedItem. The fill_color_gdk attribute is defined in /usr/include/libgnomeui/gnome-canvas-rect-ellipse.h or equivalent. When the selectedItem and the item who raises the event match, we destroy both using the GtkObject method destroy. In case there is no more shape, we build another game area. Finally, the handler always returns TRUE (1). This means the event signal is not propagated to other item. We don't want that because our shape never overlays.